Quote Reply Topic: EZCA for P3D 4.5 here !!! This is new version of EZ which compatible with P3D 4.5. (Update only). This is BETA for test but fully functional. If you have any troubles or incompatiblites with P3D 4.5 , please write here. Ezca 3.01.65 update dont work. "connecting with simconnect..." .waiting 10 min. and nothing happend. This beta update worked when I first launched P3Dv45 with the default scenario. Then I closed the simukator and relaunched it with AS4, Rex SF3D and tried to load another plane (Dash8) at some addon airport. Do you reboot the PC between each test or flight or aircraft change? Are all your add-ons and aircraft already fully supported in P4Dv4.5? Mine are not and could crash the Sim at any time. Bad for testing . I just done a full uninstall reinstall of Ezdok but same problem arises again. I've updated P3D client only from v4.4 to v4.5, all addons used were updated to be compatible with v4.5. The weird thing is that Ezdok worked, but only at the very first launch.. I updated Client initially, and later Content and Scenery to P3Dv4.5, all OK (no crash). My Active sky, for example, is only for P3Dv4.4. Where did you get Active Sky for P3Dv4.5 ? Which Dash8 are you using with ezdokv3 beta for P3Dv4.5 that has already been updated for P3Dv4.5? You will find an Open Beta of ASP4 here, download version 7035. I'm unable to use my "Cooly Hat" for looking arround. And i cannot use "S" or "A" to change outside views. The first point is the most important. Any solution for this? An open beta is for testing ... Active Sky has not released a version for P3Dv4.5 yet. My hat switch is working. I do not use the "S" or "A". Well, Vaughan, ASP4 version 7035 works very fine with P3Dv4.5 . Any other ideas how to get the hat switch working? When you are testing a Beta (ezdok) with another Beta (Active Sky or an aircraft that has not been updated yet for P3Dv4.5) which is causing a crash? In my case, I will not test with a product not already approved for P3Dv4.5 by the developer. 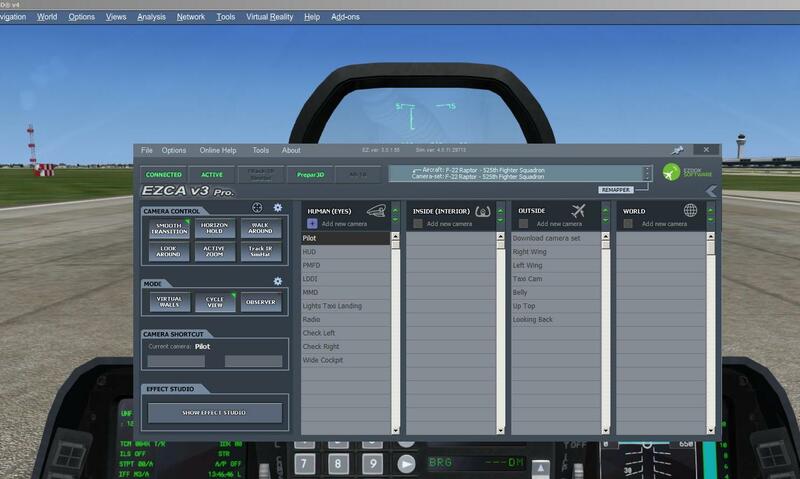 I have Active Sky and FSGRW (Flight Sim Global Real Weather) for P3Dv4.4. So, I will go without a weather program while testing P3Dv4.5 until one of them is finally approved for P3Dv4.5. Did you set up your joystick (throttle) in the Joystick Configuration menu? Also, is the coolie hat set up correctly in P3D to pan? For the cycle view issue, are the Internal EZCA Cycles set up for S, A, Shift+S and Shift+A in the Map of Assignments? Have you run the Config Tool? Uninstalled Ezdo v3, then P3d Client 4.5, then reinstalled Client 4.5 (rebooting between each action). Can you confirm that Prepar3d.exe and EZCA.exe are set to Run as Administrator in Properties/Compatibility and that the C:\Program Files\EZCA3 folder is given an exception in your virus scanner? What happens if you disable EZCA in your exe.xml and start EZCA.exe after P3D has loaded? I'm back to P3D v4.4 and maybe will try again when Ezca will get out of beta : lost too much time trying to get it work. So I installed Ezdok with the flight1 wrapper and upgraded it to Beta .62. But here is talk about .65 build ! Do you have updated EZCA to latset .65 build ? Only 3.0.1.65 version will working with p3D 4.5 ! Thank you, need to uninstall previous version or can i install it on 62 ? The base .53 version in the store of Flight1 only ! The next 62..63..65 versions - exists as updater only. Anyway before install updater, you must install base .53 version. Also you can roll back in any time to previous version. Just run updater with desired EZ version. Any help for this error, please? 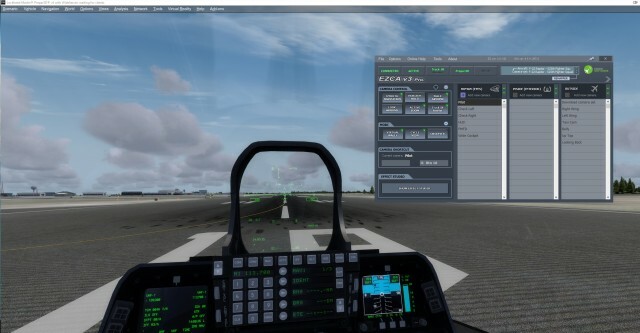 Is Activesky for P3Dv4.5 still in Beta (testing) version? For every flight, I have to import camera set !!!!!!! And during flight, EZCA3 stops due to .... licence ! I did reinstal EZCA3 with no antivirus protection ! Here is an image better than a long speech ! Is this because ActiveSky is in Beta testing for P3Dv4.5? My ezdok refuses to launch with P3D now. If I manually start the program, it does work. Which version of P3D and Ezdok are you using? I just purchased last night via Flight1 after updating to P3d V4.5. Ensured clean install. My ezdok refuses to launch with P3D. If I manually start the program, eventually comes on but hangs for message "Connecting with simconnect..." after 10 mins or so then crashes. There is an entry for ezdok in exe.xml and appears to be correct. Any ideas on a fix or workaround? Or should I have purchased chaseplane instead?? Which version of EZdok did you install? Have you read the posts in this topic? Did you read Marniftarr's post in this topic? Just run updater with desired EZ version." "I just purchased last night via Flight1 after updating to P3d V4.5. Ensured clean install. My ezdok refuses to launch with P3D." JJ, ensure EZCA.exe and config.exe (in the Program Files\EZCA3 folder) are set to Run As Administrator in Properties/Compatibility tab. Same for Prepar3D.exe. Also, ensure there is an exception in your virus scanner for the EZCA3 folder. Finally, when you launch P3D, does the EZCA Launcher appear on the taskbar? 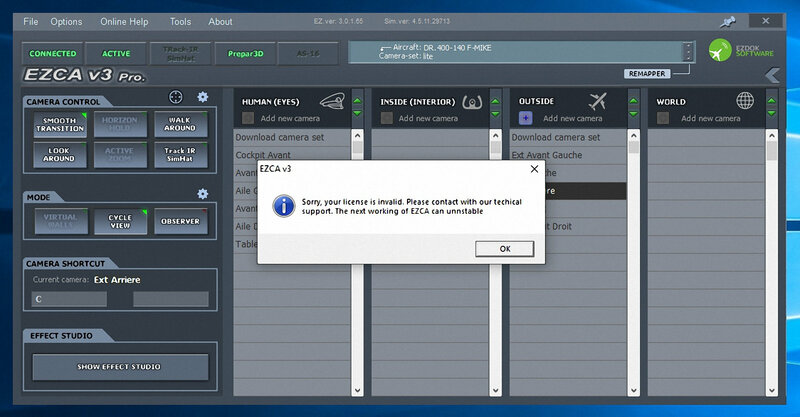 Are there any EZCA entries showing in Task Manager after P3D runs? 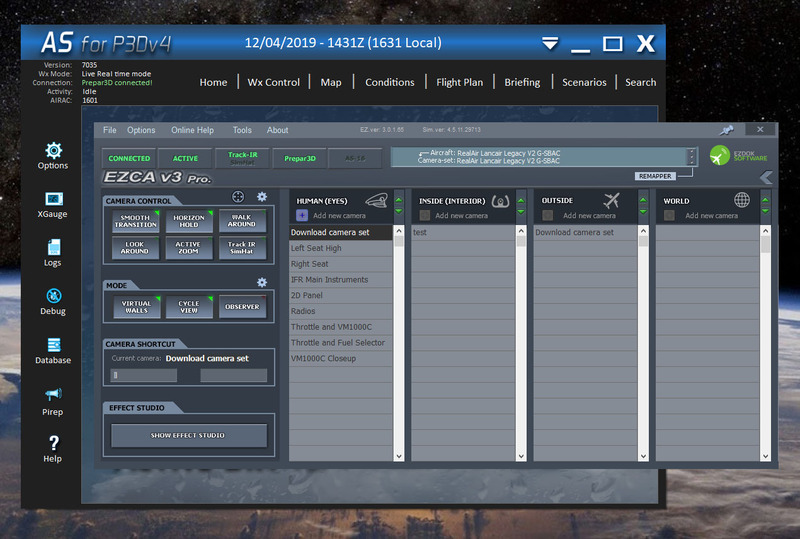 Also, there are 4 simconnect versions that should be installed (unless your OS is set to Japanese or Russian) in the Prepar3D v4\redist\Interface ESPv1, FSX-RTM, FSX-SP1 and FSX-SP2-XPACK subfolders. Just drill down, find and run the SimConnect.msi files. Also, reboot before testing. EZCA.exe looks like it attempts to launch but closes. Was it present in the top Sim addons drop down menu? Did you have a previous version of Ezdok that did work? Mine does the same thing, but re-opens and closes several times until p3d scenario screen, at that moment it stays open and works just fine. Don't know what triggers with the initial open close open close issue really.